The concept of Precision and Rally flying started in the Scandinavian countries between the two world wars. The object was to create a set of skills that combined hunting, flying and cross country skiing. So imagine flying to some remote location, landing in the mountains, skiing to a likely spot, shooting some target (animals or enemy) and then flying off to the next spot, to repeat the exercise. This sounded like a good idea at the time and for a few years the concept caught on with the Scandinavian countries, with regular competitions being held. After the Second World War more countries became interested in the concept and over a period of years a set of rules was drawn up that separated out the flying aspects only. Later two disciplines evolved those of Precision and Rally Flying. 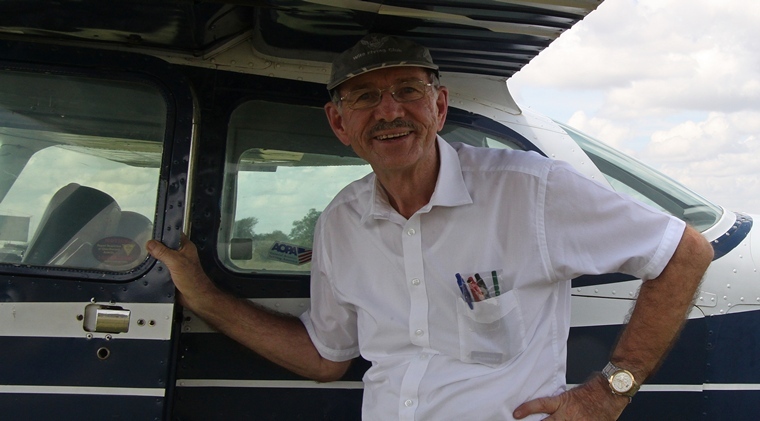 The main difference between the two is that while Rally Flying is a two crew operation Precision Flying is a solo effort by a single pilot. The two courses are pretty much the same but in precision there are secret timing points between the turn points that competitors need to cross and the photographs are not in sequence. A landing component of four landings forms an important part of the competition and includes two power landings, one of which is a landing over an obstacle as well as a glide approach with flaps and one without flaps. 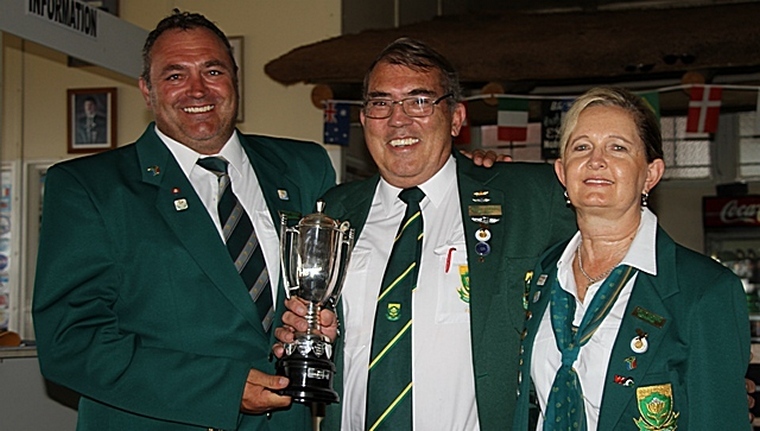 Members of the team are awarded Protea colours. However, they partake at their own cost which can be substantial. 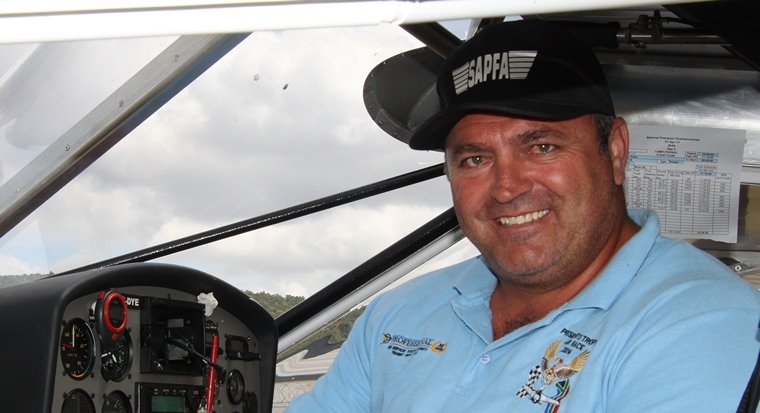 Besides the normal expenses associated with travelling abroad competitors must pay for the lease of aircraft, not just for the actual Championships but also for practise beforehand. 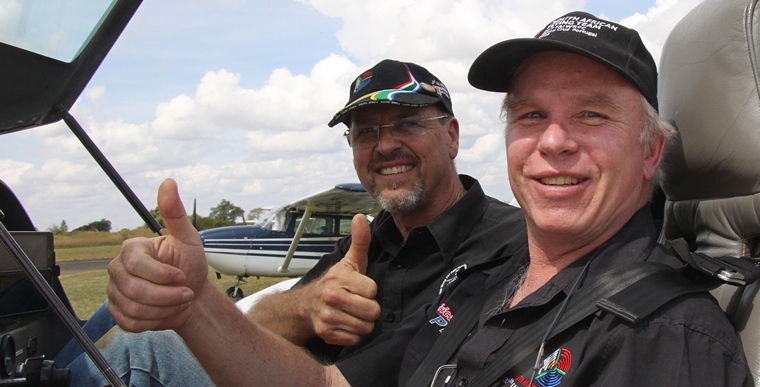 Martin Meyer and Rob Jonkers who took part in the Rally Competition. 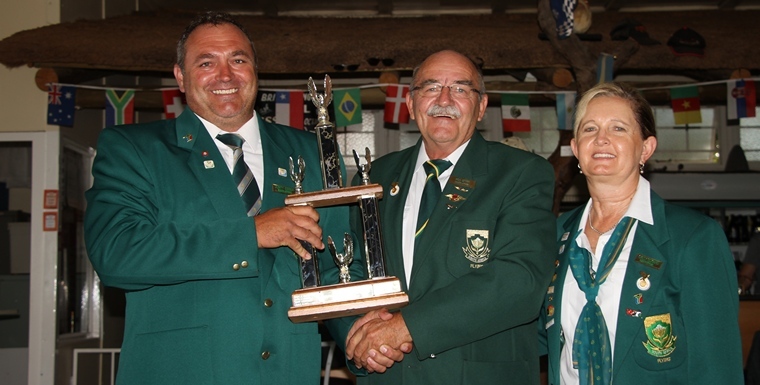 The Nationals were held at Brits Airfield in the North West from Thursday 6th April to Saturday the 8th to pick a team to represent SA at the world championships to be held at Spitzenburg, Vienna, Austria from 29 July to 5 August. Nine pilots entered and from day one with four of the nine all scoring in the low hundreds. 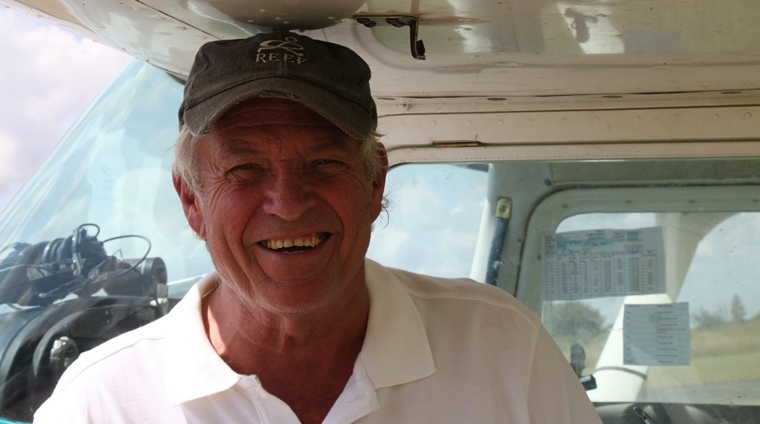 Adrien Pilling flying a Cessna 150 led the pack with 255 penalty in a points followed by Frank Eckhard in a Cessna 152 with 304 penalty points with Ron Stirk also in a C150 with 354 penalty points. By day two it a trend was already emerging. Adrian again led the pack, finishing with 219 penalty points. Frank was again in second with 325 penalty points. Ron remained in third place with 393 penalty points. Due to the possibility of inclement weather on Saturday the landing component of the competition was held on Friday. Ron Stirk took the laurels with a score of 72, followed closely by Hans Schwebel on 100 with Adrian Pilling on 106. 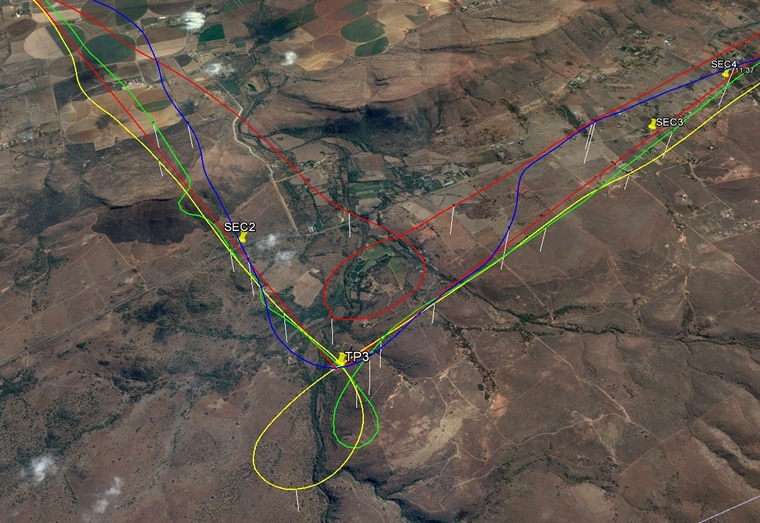 As a first attempt at real time tracking for rally / precision flying, this was set-up for the Saturday as the 3rd day of the competition. 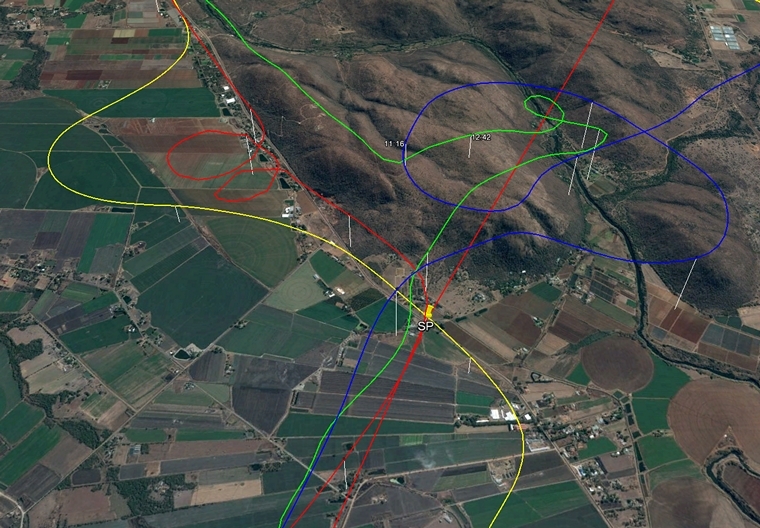 Here is an overlay in Google Earth of four different tracks competitors flew to give an idea of the variation in making all the turn points. A trial was originally run on two tracks which was recorded at the Brits rally training camp in March (although not seen live) to determine the feasibility for this. Then at least there is some spectator sport at following the competitors around the course, and of course to see exactly where mistakes are made�. The app being used is LiveTrack24, available to anybody to track any sporting event, so it can be watched at home by the family in real time. 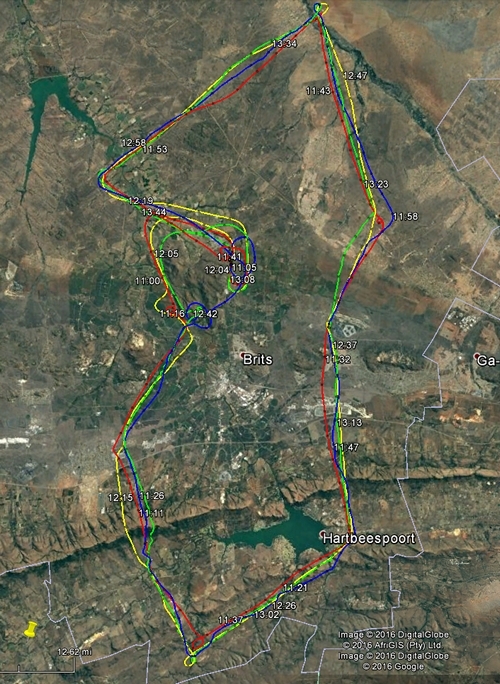 For this event, 6 competitors were set up to be followed, being as simple as loading the app on a smart phone and letting it run while flying, as all that is needed is to ensure the phone can see the GPS satellites, and can maintain cell phone GPRS connection. If connection to the cell network is lost, it keeps the recording going until the next cell mast is picked up. As the flying is mostly around 1200 - 1500 ft above ground the cell connections remain mostly good. Four competitors with their different strategies and routes in getting to the Start Point on Time. 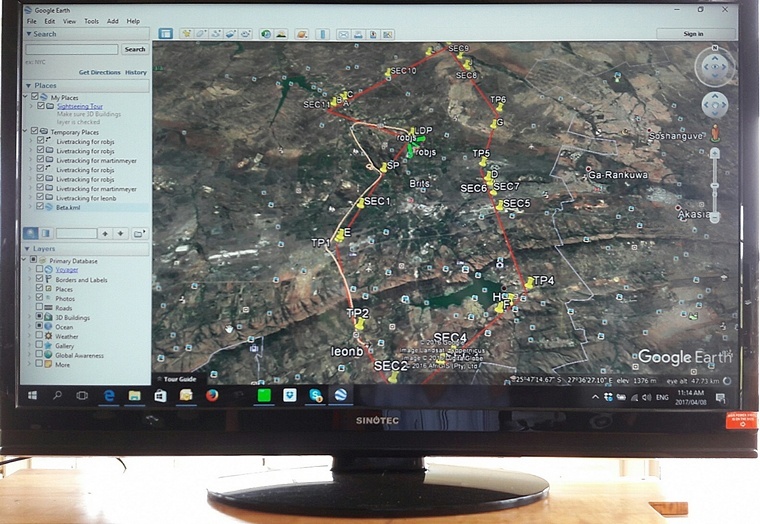 The tracks can be seen in the LiveTrack24's own viewer which is based on Google Earth, or it can be seen in Google Earth, which has the advantage of loading the rally route as well, so one can see where the competitors are supposed to go. As the picture above shows, all the competitors had different strategies in getting the start point at the required time, this point notoriously difficult to find and to get the timing right, at least these guys got through the start gate in some manner. The big screen at the Brits Clubhouse where Leon Boutell's track as the first track in view is being followed real time. As more competitors got airborne, more tracks could be followed, and of course being able to zoom in closely, you can see mistakes being made in full view, in the picture below, getting to turn point 3 which also had a 1 minute procedure turn, very interesting outcome with groans coming from the spectators - �now why is he doing that?�, where one guy forgot to do the turn, and the other went to the wrong turn point. In any event this first trial of watching tracks in real time proved to be popular, and hopefully will be at future events. The notorious turn point 3, the blue track forgot to do the 1 min procedure turn, and the red track went to the wrong turn point. The fate of the competitors was now in the hands of the judging panel consisting of Arddyn Moolman, Walter Walle and Deon vd Berg. The competitors waited anxiously as the logger printouts were scrutinised and the scores were tallied. Adrian Pilling who had consistently led the pack during the three days of the competition took the Laurels and is the South African Precision Champion of 2017.
and Ron Stirk in 3rd. 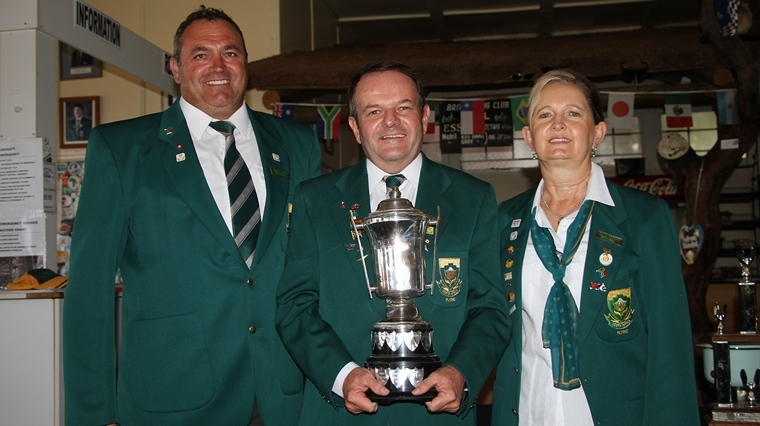 The team that will be representing South Africa at the World Championships. 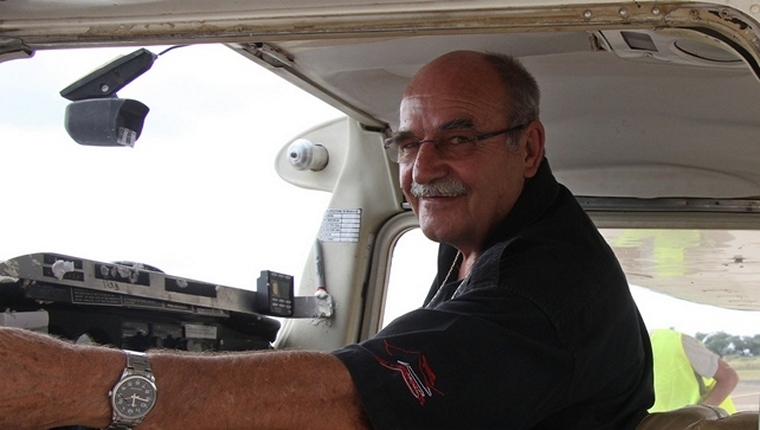 From left to right: Ron Stirk, Frank Eckard, Thys vd Merwe, Andre Kluyts, Johnty Esser, Arddyn Moolman (International Judge) and Hans Schwebel (President of the Jury). Not present Mary de Klerk, team manager. Our congratulation to the winners and we wish the team all the best. Make us proud!